The forthcoming 5th Edition will be the largest and most comprehensive guide yet to what is undoubtedly the most complex and mis-understood world silver category. Well over 1000 pages, the guide will catalogue makers, retailers and artisans spanning four centuries. Adrien von Ferscht is now in the 8th year of his intensive research into this complex silver. This new edition will reflect the many glass ceilings of information that have been smashed since the 4th Edition was launch in 2015. The new edition may be ordered now. It not only gives an in depth guide to retail and manufacturing silversmiths’ silver marks but also the highly definitive styles many of them evolved. 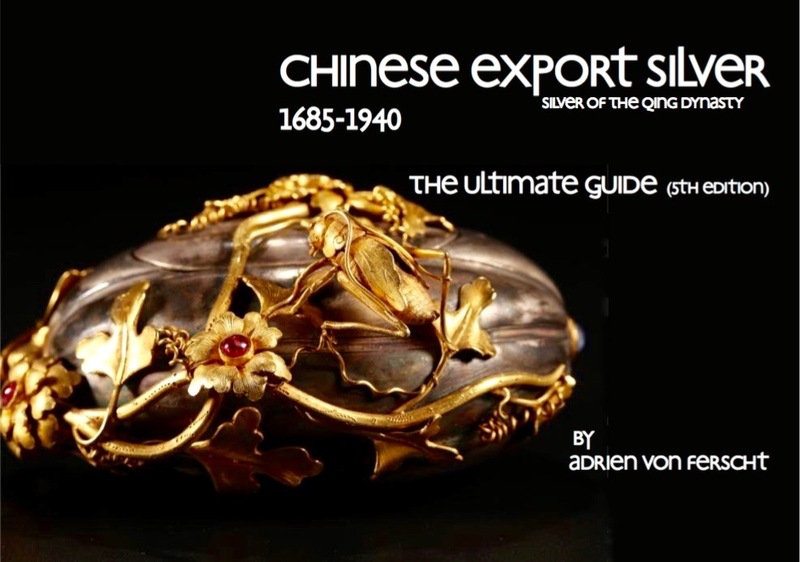 As a body of work, it clarifies many of the long-standing misconceptions that have arisen over the years and presents the historical evidence of how the phenomenon came into being and how it existed and interacted alongside silver that was made for the China market. Over 1000 pages, the book represents 5 years of research by Adrien von Ferscht who is recognised around the world as the expert for this unique and highly complex silver category. The research and the book is created in conjunction with 3 universities and is now recognised as the definitive reference guide, in particular in China itself where the awareness and understanding of this silver is growing fast. If you have any questions on this or any other item for sale, please email and you will receive a reply. We have not talked in a couple of years. I came back to the links and pages you sent to me back then, and I thought I had purchased your book Chinese Export Silver…” at that time, but can not find it. I was looking into a Chinese export silver piece a client has. So, I clicked on your book link to buy it again (or possibly I the first time, as I can not find it on my computer) but was not able to do so. My PayPal is browntrout@yahoo.com, can you send me an invoice so I can get it again. I hope this note finds you and all of your loved ones happy and healthy and that you are enjoying your work in China very much. Thank you, Greg C. Brown, M.S., ISA AM. Is your updated book still going to be produced this year?